When you first begin a new project, the content area of your course (the slide stage) defaults to 720 pixels wide and 540 pixels high. 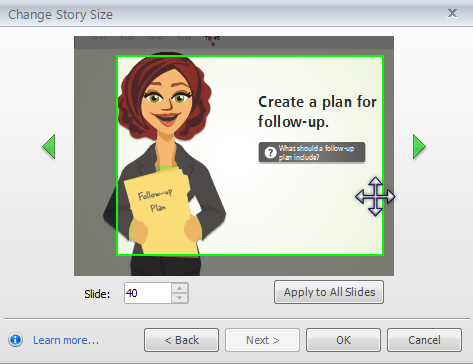 You can easily choose a different size by using the Story Size option on the Design tab of the Storyline ribbon. If you want to change the story size, it's always best to do it before you add any content to your slides. 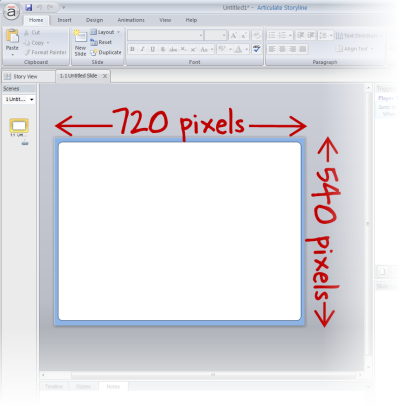 Otherwise, when you change the size, objects on your slides might need to be rearranged or resized in order to look right with the new size. Keep in mind that when you publish, the total size of your published output will be slightly larger than the dimensions you choose for the Story Size. That's because Storyline adds a little bit of height and width for the course player. Depending on the player features and controls you include, the player might add up to 260 pixels in width, and up to 118 pixels in height. For more details on customizing your player, check out this tutorial. The following window appears. 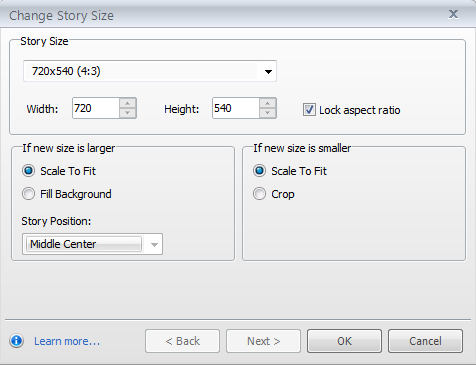 In the Story Size selector, choose one of the preset sizes, or choose Custom. If you choose Custom, you can set the exact pixel width and height for your slide stage by entering numbers in the Width and Height fields, or by clicking the arrows to change these settings. Leave the Lock aspect ratio box selected if you want to keep the current proportions. That way, if you change the width or height, the other setting will change proportionately. Scale To Fit: This scales the contents of your slides to fit proportionately within the new size. Fill Background: This retains the current slide background and applies it to the new size, but it doesn't resize your slide content. If you choose this, you'll also need to use the Story Position selector to choose where on the slide you want your existing content to appear. Crop: This crops your content to fit within the new size. Click Next to use the cropping tool to choose the crop area of each slide. Move the box to indicate the part of your content that you want to appear on the slide. Then either click Apply to All Slides, or use the green arrows or the Slide field to view and crop additional slides until you're finished. Click OK when you're satisfied with the cropping on all your slides. Click OK to go back to your slide content.